The Man Of Steel #6, by Brian Michael Bendis, Jason Fabok, Alex Sinclair, and Josh Reed, is the final issue of Bendis’ first DC work. There’s a lot to tie up here and Bendis’ endings aren’t always the best. Will he be able to stick the landing? 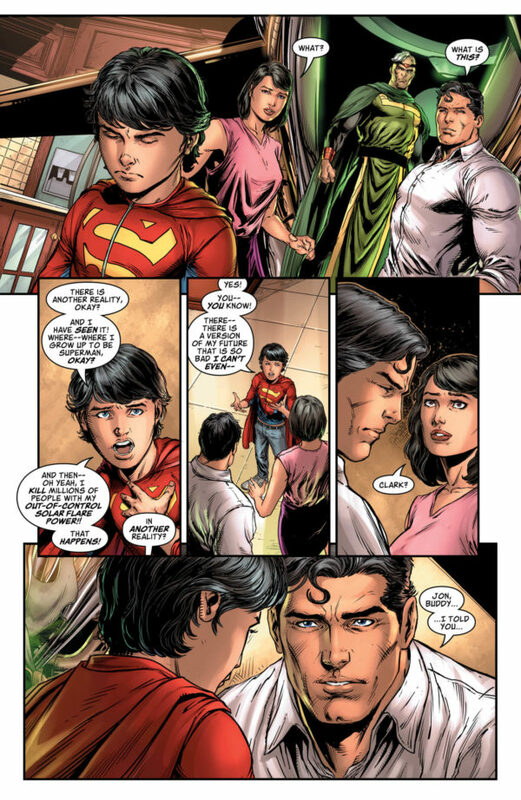 The dramatic meat of the story is the decision of the Kent family whether Jon will leave with Jor-El. The narrative swings back and forth between that scene and the present day, as Superman battles Rogol Zaar, trying to stop him from destroying the Earth. With a little help from Supergirl, he’s able to defeat Zaar in a rather clever way. Supergirl decides to hunt down answers about Zaar, and another member of Superman’s family leaves him. Back in Metropolis, a young boy has information on who has been setting the fires and it’s a definite shocker. The problem with this issue is that Bendis drags out the decision that most readers guessed would be made. Jon’s reasoning for wanting to go on this voyage are sound and even play into stuff from Super-Sons, but it was easy to guess what the final decision would be. While this reveal has been underwhelming, it sets up a lot of intriguing story ideas for the future; Bendis keeps hammering away at it in this installment, and it sort of kills a lot of momentum this book has had. One of the strengths of The Man Of Steel so far is that Bendis has done a way better job of pacing things and letting each plot breath and this issue does away with that. Too many pages are devoted to a conclusion that everyone saw coming after last issue. Clark, Lois, and Jor-El are all smart people, and it’s surprising that they wouldn’t have come to the conclusion they did faster. It stinks of a writer trying to fill pages and it’s really sad that this is how what has been a well paced, action-packed, and interesting book ends. That’s not to say it’s all bad. There’s a narrative resonance to his whole family leaving Superman to go on their adventures for different reasons that works very well. Supergirl, and the way she takes down Zaar, are fitting because of his crimes. Superman’s emotional state makes a little more sense now that it’s been completely revealed what happened. He’s sad, yes, but he’s also angry at his father for showing up and taking his family away. The reveal at the end of who the young boy says is setting the fires is intriguing and, while it’s definitely a red herring, it can lead to something that is extremely worthwhile if executed correctly. Jason Fabok’s art is a highlight of the book. His acting gets across what the characters are feeling in the more dramatic sections of the book and his action sequences are top notch as always. His art would have been the best on the book so far if it hadn’t come after Adam Hughes’ amazing pencils from last issue. Hughes used color and page layout in ways that Fabok doesn’t and it makes a huge difference. In comparison, Fabok’s art feels standard. It looks great, but it doesn’t have the kick that Hughes’ did. Hughes’ art took the script to higher places; Fabok’s dutifully and efficiently lays out what the script says. It’s main flaw is that it follows art that was transcendent. The Man Of Steel #6 lays down a lot of ideas that could blossom into great stories, but it falls into the trap of Bendis and his tropes. The last issue’s ending made it look like this one was going to be a slam bang action epic and instead Bendis focuses on the familial drama of the Kents. This wouldn’t be a bad thing if those scenes didn’t feel so drawn out. As a whole, this book would have been better served if Bendis would have done more revealing of what happened to Jon and Lois in previous issues instead of using a lot of this issue’s page real estate to do it. In fact, it retroactively makes the way he paced past issues seem worse than it did at the time. If the real crux of this whole mini series was Lois and Jon’s disappearance, and the amount of pages devoted to it in this issue gives that impression, than Bendis should have been spending more time with it than he did and maybe gave less time to the arson subplot or Rogol Zaar in the past. Bendis has always been a writer who is more interested in the drama and how it affects characters than the action of superheroing, and that isn’t a bad thing, but he focuses on that drama to the detriment of the superheroing at inopportune times, and this comic is a perfect example of that. It’s a good comic that sets up several things for the future, but it’s not as good as it was building up to be and that’s a disappointment. As a whole, The Man Of Steel did a lot of things right and proves that Bendis can be a good fit for Superman, that he can mostly transcend a lot of the negatives in his work, and that he can set up things that may provide great stories down the pipe. This issue shows that he can still falter sometimes, though. It’s a good comic in an otherwise great miniseries. So, sure, it’s a disappointment, but it’s a disappointment in that it wasn’t as well done as the other five issues, but is still a worthwhile read.